If you are undamaged, as perfect and pristine as a new-born baby, stop reading now. But if you have been battered and bruised on your journey through life, please read on. Kinstugi is about growth through experience, celebrating repair and honouring scars. It began with a tea cup, but now encompasses glassware, and even iPhones. When we break a cup or a bowl, most of us are inclined to throw it away. If it was a favourite, we might be sad, and we might even try to glue it back together. If we do, we’ll do our best to hide the repair, to make it seem as if the accident never happened. And no doubt we’ve all made mistakes in life, done things we regretted, and been hurt by misadventures. But would we be who we are without those experiences? Shouldn’t we accept our past – both good and bad – as part of who we are? Even better, we can celebrate our trials and tribulations, taking pride in getting on with our lives despite the difficulties we have overcome. And why not the same for our faithful possessions: the cups, bowls, plates and other utensils that serve us every day? Is not a glass once broken and repaired more beautiful than one fresh from the shop? It has been with us on a journey, and the repair documents an event in our shared existence. 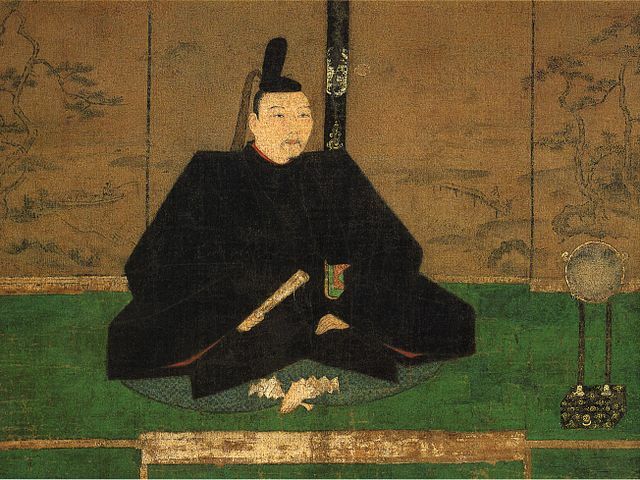 Kintsugi is said to have originated in the 15th century when the shogun Ashikaga Yoshimasa sent a tea cup back to China to be repaired. 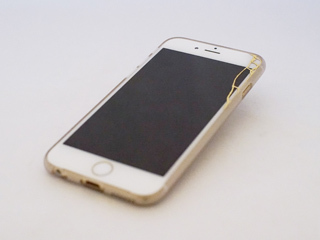 When it came back fixed with ugly metal staples, Yoshimasa sought a better way to make the fix. Craftsmen developed a technique of gluing bits of pottery back together using lacquer mixed with gold, leaving a beautiful join that spoke of the object’s history. 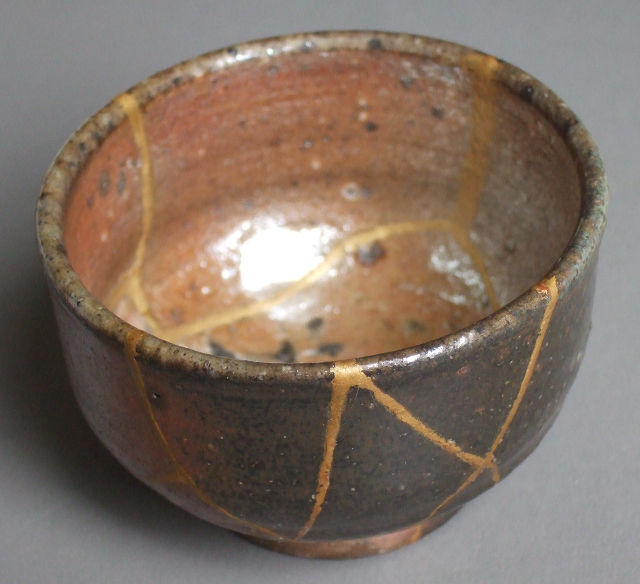 Kintsugi rapidly became popular, and ceramics were said to grow and become more exquisite with every repair. There are even rumours of valuable tableware being deliberately smashed so it could be repaired with gold. Quite how anyone could find beauty in such an act of wanton cruelty is beyond me. Such actions are nothing but hideous travesty. Who could take pleasure in drinking from a cup defaced by an act of unprovoked violence? Please, please, respect your possessions and show appreciation for their faithful service. 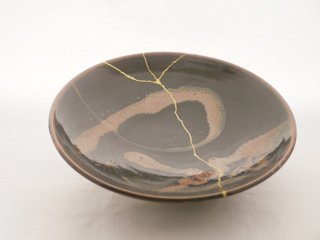 Nowadays we can distinguish three styles of kintsugi. When all the pieces have survived, they can simply be glued back together, only the thin seams of gold testifying to the mishap. But if a section of the object has been lost, we must replace it. The first option is to fill the space with gold lacquer, molding it into the shape of the missing piece – so the object appears as new to the touch, but its past gleams goldenly to the eye. The final option is to find a broken piece from another object that fits the empty space. Once this is fixed in place with golden glue, the object is now augmented with a mismatched transplant, adding a touch of mystique. 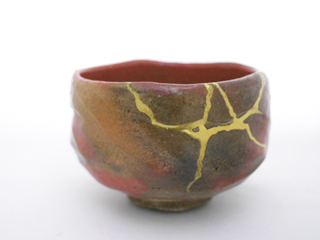 The art of kintsugi stands in direct opposition to the tide of consumer culture – but for me that only makes it even more precious. The world is changing at a rate never before seen, as technology advances and society reshapes and adapts. Is it not worth preserving our possessions, taking joy in years of faithful service? Do you not want to take at least some items with you on your journey through life, rather than disposing of them as soon as they are injured? If you smash the screen of your smartphone, or break the handle off a mug, why not show it some love? Kintsugi repair kits can be bought from Mejiro, and many countries have companies that undertake kintsugi repairs professionally. The more you care for your possessions, the more they will care for you. Do you think that the cracks add to or detract from this plate’s beauty? Photo courtesy of Koishihara. 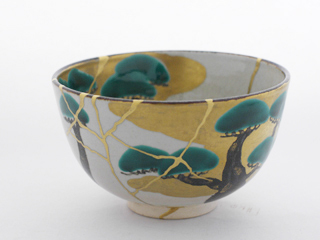 This teacup suffered a catastrophic injury when it was dropped, but kinstugi has allowed it to continue its graceful work as part of its owner’s tea ceremonies. Photo courtesy of Koishihara. Even modern technology can benefit from a bit of TLC. Photo courtesy of Koishihara. 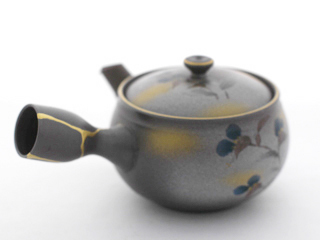 This teapot was the customer’s favourite, so when its handle had an accident, they asked if it could be repaired. Photo courtesy of Koishihara. 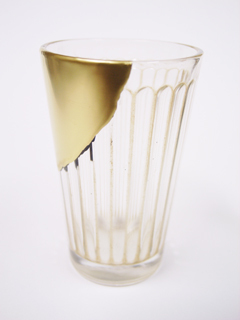 This glass was a treasured possession, so when it was broken, the owner asked if it could be repaired. The missing section had been smashed into fragments, so the whole section was replaced with black laquer, which was then covered with gold. Photo courtesy of Koishihara. This teacup was broken into fragments, and then glued back together. The result was less than satifying, so the owner, who had inherited it from their father, had it taken apart and repaired with gold. Photo courtesy of Koishihara.